The Basin and Range Province is a vast physiographic region covering much of the inland Western United States and northwestern Mexico. It is defined by unique basin and range topography, characterized by abrupt changes in elevation, alternating between narrow faulted mountain chains and flat arid valleys or basins. The physiography of the province is the result of tectonic extension that began around 17 million years ago in the early Miocene epoch. The numerous ranges within the province in the United States are collectively referred to as the "Great Basin Ranges", although many are not actually in the Great Basin. Major ranges include the Snake Range, the Panamint Range, the White Mountains, the Sandia Mountains, and the Tetons. The highest point fully within the province is White Mountain Peak in California, while the lowest point is the Badwater Basin in Death Valley at −282 feet (−86 m). The province's climate is arid, with numerous ecoregions. Most North American deserts are located within it. Clarence Dutton famously compared the many narrow parallel mountain ranges that distinguish the unique topography of the Basin and Range to an "army of caterpillars marching toward Mexico." The Basin and Range Province should not be confused with The Great Basin, which is a sub-section of the greater Basin and Range physiographic region defined by its unique hydrological characteristics (internal drainage). The Basin and Range Province includes much of western North America. In the United States, it is bordered on the west by the eastern fault scarp of the Sierra Nevada and spans over 500 miles (800 km) to its eastern border marked by the Wasatch Fault, the Colorado Plateau and the Rio Grande Rift. The province extends north to the Columbia Plateau and south as far as the Trans-Mexican Volcanic Belt in Mexico, though the southern boundaries of the Basin and Range are debated. In Mexico, the Basin and Range Province is dominated by and largely synonymous with the Mexican Plateau. Evidence suggests that the less-recognized southern portion of the province is bounded on the east by the Laramide Thrust Front of the Sierra Madre Oriental and on the west by the Gulf of California and Baja Peninsula with notably less faulting apparent in the Sierra Madre Occidental in the center of the southernmost Basin and Range Province. Common geographic features include numerous endorheic basins, ephemeral lakes, plateaus, and valleys alternating with mountains (as described below). The area is mostly arid and sparsely populated, although there are several major metropolitan areas, such as Las Vegas, Phoenix and Tucson. It is generally accepted that basin and range topography is the result of extension and thinning of the lithosphere, which is composed of crust and upper mantle. Extensional environments like the Basin and Range are characterized by listric normal faulting, or faults that level out with depth. Opposing normal faults link at depth producing a horst and graben geometry, where horst refers to the upthrown fault block and graben to the down dropped fault block. The average crustal thickness of the Basin and Range Province is approximately 30 – 35 km and is comparable to extended continental crust around the world. The crust in conjunction with the upper mantle comprises the lithosphere. The base of the lithosphere beneath the Basin and Range is estimated to be about 60 – 70 km. Opinions vary regarding the total extension of the region; however, the median estimate is about 100% total lateral extension. Total lateral displacement in the Basin and Range varies from 60 – 300 km since the onset of extension in the Early Miocene with the southern portion of the province representing a greater degree of displacement than the north. Evidence exists to suggest that extension initially began in the southern Basin and Range and propagated north over time. The tectonic mechanisms responsible for lithospheric extension in the Basin and Range province are controversial, and several competing hypotheses attempt to explain it. Key events preceding Basin and Range extension in the western United States include a long period of compression due to the subduction of the Farallon Plate under the west coast of the North American continental plate which stimulated the thickening of the crust. Most of the pertinent tectonic plate movement associated with the province occurred in Neogene time and continues to the present. By Early Miocene time, much of the Farallon Plate had been consumed, and the seafloor spreading ridge that separated the Farallon Plate from the Pacific Plate (East Pacific Rise) approached North America. In the Middle Miocene, the East Pacific Rise was subducted beneath North America ending subduction along this part of the Pacific margin; however, the Farallon Plate continued to subduct into the mantle. The movement at this boundary divided the East Pacific Rise and spawned the San Andreas transform fault, generating an oblique strike-slip component. Today, the Pacific Plate moves north-westward relative to North America, a configuration which has given rise to increased shearing along the continental margin. 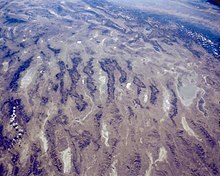 The tectonic activity responsible for the extension in the Basin and Range is a complex and controversial issue among the geoscience community. The most accepted hypothesis suggests that crustal shearing associated with the San Andreas Fault caused spontaneous extensional faulting similar to that seen in the Great Basin. However, plate movement alone does not account for the high elevation of the Basin and Range region. The western United States is a region of high heat flow which lowers the density of the lithosphere and stimulates isostatic uplift as a consequence. Lithospheric regions characterized by elevated heat flow are weak and extensional deformation can occur over a broad region. Basin and Range extension is therefore thought to be unrelated to the kind of extension produced by mantle upwelling which may cause narrow rift zones, such as the Afar Triple Junction. Geologic processes that elevate heat flow are varied, however some researchers suggest that heat generated at a subduction zone is transferred to the overriding plate as subduction proceeds. Fluids along fault zones then transfer heat vertically through the crust. This model has led to increasing interest in geothermal systems in the Basin and Range, and requires consideration of the continued influence of the fully subducted Farallon plate in the extension responsible for the Basin and Range Province. In some localities in the Basin and Range, metamorphic basement is visible at the surface. Some of these are metamorphic core complex (MCC), an idea that was first developed based on studies in this province. A metamorphic core complex occurs when lower crust is brought to the surface as a result of extension. MCCs in the Basin and Range were not interpreted as being related to crustal extension until after the 1960s. Since then, similar deformational patterns have been identified in MCCs in the Basin and Range and has led geologists to examine them as a group of related geologic features formed by Cenozoic crustal extension. The study of metamorphic core complexes has provided valuable insight into the extensional processes driving Basin and Range formation. Prior to the Eocene Epoch (55.8 ±0.2 to 33.9 ±0.1 Ma) the convergence rate of the Farallon and North American Plates was fast, the angle of subduction was shallow, and the slab width was huge. During the Eocene the Farallon Plate subduction-associated compressive forces of the Laramide, Sevier and Nevada orogenies ended, plate interactions changed from orthogonal compression to oblique strike-slip, and volcanism in the Basin and Range Province flared up (Mid-Tertiary ignimbrite flare-up). It is suggested that this plate continued to be underthrust until about 19 Ma, at which time it was completely consumed and volcanic activity ceased, in part. Olivine basalt from the oceanic ridge erupted around 17 Ma and extension began. Northwest Nevada volcanic field (NWNV), it is proposed[by whom?] that it is part of the Yellowstone hotspot trail. Trans-Challis fault system between Idaho City and Gibbonsville. Twin Peaks and Van Horn Caldera in-between. San Juan volcanic field: La Garita Caldera. Central Colorado volcanic field: Thirtynine Mile volcanic area. In addition to small amounts of Nevada petroleum, the Basin and Range Province supplies nearly all the copper and most of the gold, silver, and barite mined in the United States. ^ Reynolds, D., & Christensen, J. (2001). Nevada. Portland, Or: Graphic Arts Center Pub. ^ Henry, C., & Aranda-Gomez, J. (1992). The real southern Basin and Range: Mid- to late Cenozoic extension in Mexico. Geology, 20701-704. Retrieved from General Science Abstracts (H.W. Wilson) database. ^ Dickinson, William R. (2002). "The Basin and Range Province as a Composite Extensional Domain". International Geology Review. 22 (1): 1–38. Bibcode:2002IGRv...44....1D. doi:10.2747/0020-6814.44.1.1. ^ Mooney, Walter D., Braile, Lawrence W. "The seismic structure of the continental crust and upper mantle of North America." The Geology of North America- An Overview. Geological Society of America: 1989. p 42. ^ Zandt, G., S. Myers, and T. Wallace (1995), Crust and mantle structure across the Basin and Range‐Colorado Plateau boundary at 37°N latitude and implications for Cenozoic extensional mechanism, J. Geophys. Res., 100(B6), 10529-10548. ^ Salyards and Shoemaker. "Landslide and Debris Flow Deposits in Miocene Horse Spring Formation, Nevada: A Measure of Basin and Range Extension". GSA Centennial Field Guide, 1987. ^ a b c Riney, Brad. "Plate Tectonics." Ocean Oasis Field Guide. San Diego Natural History Museum, 2000. Web. 5 Dec 2010. ^ "Digital Geology of Idaho." Basin and Range Province – Tertiary Extension. N.p., n.d. Web. 5 Dec 2010. ^ Stanley, S. M. (2005). Earth system history. New York: Freeman. ^ Stern, Robert J. Class Lecture. Rifts. Physics and Chemistry of the Solid Earth. University of Texas at Dallas, Dallas, TX. 1 Sept 2010. ^ Goto, Kinoshita, and Yamano. "High heat flow anomalies on an old oceanic plate observed seaward of the Japan Trench". International Journal of Earth Science, 2008, vol. 97, p. 345 – 352. ^ Rystrom, V. L. Metamorphic Core Complexes. 2000. 5 Dec. 2010. ^ McKee, E. H. (1971). "Tertiary Igneous Chronology of the Great Basin of Western United States–Implications for Tectonic Models". Geological Society of America Bulletin. 82 (12): 3497–3502. Bibcode:1971GSAB...82.3497M. doi:10.1130/0016-7606(1971)82[3497:ticotg]2.0.co;2. Retrieved 2010-04-09. ^ "Northwest Origins, An Introduction to the Geologic History of Washington State, Catherine L. Townsend and John T. Figge". The Burke Museum of Natural History and Culture, University of Washington. Retrieved 2010-04-10. ^ "Oregon: A Geologic History". Oregon Department of Geology and Mineral Industries. Archived from the original on 2010-01-28. Retrieved 2010-03-26. ^ "Digital Geology of Idaho, Laura DeGrey and Paul Link". Idaho State University. Retrieved 2010-04-10. ^ a b Figure from Brueseke, Matthew E.; Hart, William K. (2008). Geology and Petrology of the Mid-Miocene Santa Rosa-Calico Volcanic Field, northern Nevada (PDF). Reno, Nevada: Mackay School of Earth Sciences and Engineering College of Science, University of Nevada. Archived from the original (PDF) on 7 June 2010. Retrieved 2010-05-04. ^ Coble, Matthew A.; Mahood, Gail A. (2008). "New geologic evidence for additional 16.5–15.5 Ma silicic calderas in northwest Nevada related to initial impingement of the Yellowstone hot spot". Earth and Environmental Science 3. 3: 012002. doi:10.1088/1755-1307/3/1/012002. ^ Brueseke, M.E. ; Hart, W.K. ; M.T. Heizler (2008). "Chemical and physical diversity of mid-Miocene silicic volcanism in northern Nevada". Bulletin of Volcanology. 70 (3): 343–360. Bibcode:2008BVol...70..343B. doi:10.1007/s00445-007-0142-5. ^ Wood, Charles A.; Jűrgen Kienle (1993). Volcanoes of North America. Cambridge University Press. pp. 284–286. ISBN 978-0-521-43811-7. Baldridge, W. Scott (13 May 2004). Geology of the American Southwest: A Journey Through Two Billion Years of Plate Tectonic History. Cambridge University Press. ISBN 978-0-521-01666-7. Fiero, Bill (2009). Geology of the Great Basin. University of Nevada Press. ISBN 978-0-87417-790-9. Plummer; McGeary; Carlson (1999). Physical Geology (Eighth ed.). Boston: McGraw-Hill. pp. 321, 513, 514. ISBN 978-0-697-37404-2. McPhee, John (1982). Basin and Range. New York: Farrar Straus & Giroux. ISBN 978-0-3-74516-901. Schellart, W.P. ; Stegman, D.R. ; Farrington, R.J.; Freeman, J.; Moresi, L. (16 July 2010). "Cenozoic Tectonics of Western North America Controlled by Evolving Width of Farallon Slab". Science. 329 (5989): 316–319. Bibcode:2010Sci...329..316S. doi:10.1126/science.1190366. PMID 20647465. Dickinson, William R. (December 2006). "Geotectonic Evolution of the Great Basin". Geosphere. 2 (7): 353–368. doi:10.1130/GES00054.1.